Saint Alberto Hurtado, S.J. is one of the most recent Sodalists to be Canonized. Born in Chile in 1901, he studied at the Jesuit College of San Ignacio in Santiago and qualified as a lawyer before entering the Jesuit Noviciate in 1923. 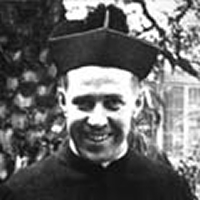 He pursued studies in Spain, Belgium and Ireland and was ordained to the Priesthood in 1933. He returned to Chile in 1936 where he was appointed professor of Religion at the Colegio San Ignacio and professor of pedagogy at the Catholic University of Santiago. During this time he was appointed Director of the Student Sodality and began a life-long apostolate to the poor. In 1941, he published a notable work entitled Is Chile a Catholic Country? Also during this time he established shelters called Hogar de Cristo (Hearth of Christ), which took in all children in need of food and shelter, assisting an estimated 850,000 between 1945 and 1951. He died in 1952. He was beatified in 1994 and was canonized in 2005. His feast day is 18th August.